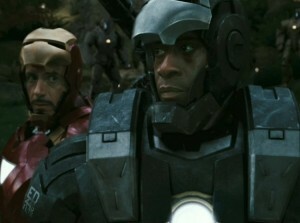 Don Cheadle has the job of taking over from the other fella. Cheadle assumes the role of Rhodey which means he also gets to become War Machine. I caught up with the very cool Cheadle to talk about what it’s like inside such a massive piece of metal; the War Machine. Jon Favreau is one happy fella. 14 years ago he was running around with Vince Vaughan in Swingers. Now he is at the top of the bunch when it comes to directing big movies. He has brought out the best in Robert Downey Jr giving him another crack at superstardom. In Iron Man 2 he seeks to set up the Marvel business with plenty of openings for follow up movies. Let’s hope he takes a well earned break and comes back fresh and leads on to Iron Man 3. On an acting note he again plays Happy Hogan. In the comic books he is meant to be laying on top of Pepper Potts……WATCH what he has to say about this in the interview…. It’s only fitting that we now get to see Scarlett Johansson running around beating guys up in a superhero movie. It’s the logical next step if you are one of the hottest ladies in the world. I caught up with her to discuss her role as Black Widow in Iron Man 2. I walked into the room to meet her and was immediately baffled by how amazing she looked. She also had a swag about her that said “I could kick your arse too”. WATCH HERE…..let me know what you think in the comments below….